Conviction of a gun possession charge or a firearms offence, can result in serious penalties, including jail, fines and a permanent mark on your criminal record. With more than 30 years of experience, David G. Bayliss is a veteran of defending firearms offences and related charges. Canada’s firearms laws have recently undergone dramatic changes. Now, almost all gun possession and firearms offences carry mandatory minimum jail sentences ranging up to seven years. On November 12, 2013, the Ontario Court of Appeal struck down the three year mandatory minimum for illegal possession of a loaded handgun. http://www.ctvnews.ca/canada/ontario-s-top-court-rules-gun-sentencing-law-is-unconstitutional-1.1538973. It is expected that the government will appeal this ruling to the Supreme Court of Canada. If and until the Supreme Court overrules the Ontario Court of Appeal decision, there is effectively no mandatory minimum sentence for illegal gun possession in Canada. Obtaining bail in these cases is also much more difficult than in the past. Additionally, if a criminal charge such as assault is accompanied by a firearms offence, the defendant faces significantly enhanced penalties. Seek legal counsel as soon as possible if you or a family member has been charged with any type of firearms offence. 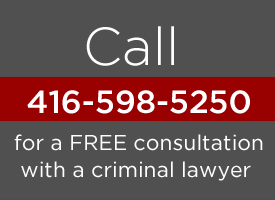 Contact the criminal law firm of David G. Bayliss online or call 416.598.5250 to schedule a free initial consultation with a highly experienced Toronto defence lawyer with a strong history of success.